I realized I had about a kilo of flour that was due to expire. 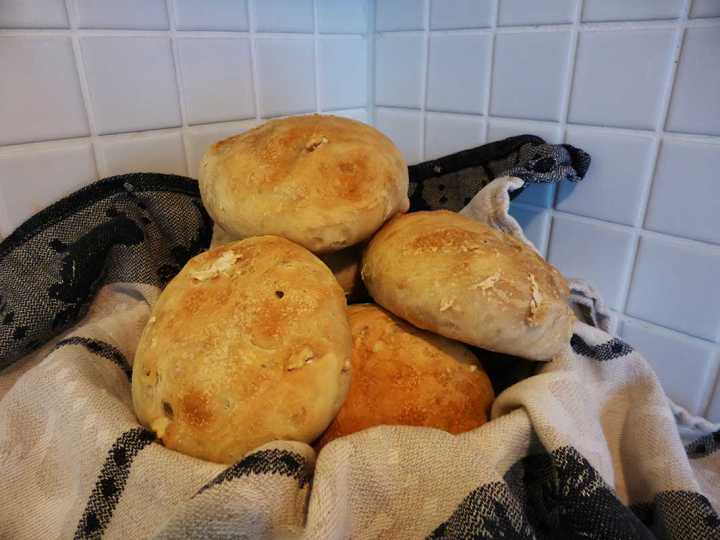 Figuring I might as well use it to fight hunger locally, I went out and grabbed some yeast and made two batches of these bread rolls. That left me with zero flour and 25 grams of yeast left over, so out I went and bought another bag of flour for a third batch. All through this I struggled to remember the recipe. It was one of those recipes that are so simple that you think you can't possible forget them. Anyway, here it is - for my reference and your enjoyment. Bread rolls that can be prepared in the evening and then finished in the morning for a great addition to the breakfast. The simple mnemonic for the recipe that I use is "one liter of dough, seven deciliters dry, three wet, tablespoons and a teaspoon". Measure up the water. We don't want to activate the yeast, so it's important to keep the water cold. Mix the liquid and solids. Knead the dough until it is, well, a dough. Chop the dough into as many pieces as you want (8 for example). Put them on a sheet of baking paper on a baking pan. Cover it all and put in the fridge overnight. In the morning, heat the oven to 250 °C. Remove the cover, put the pan and rolls into the oven for ten minutes. Also, this is entry number 1234!